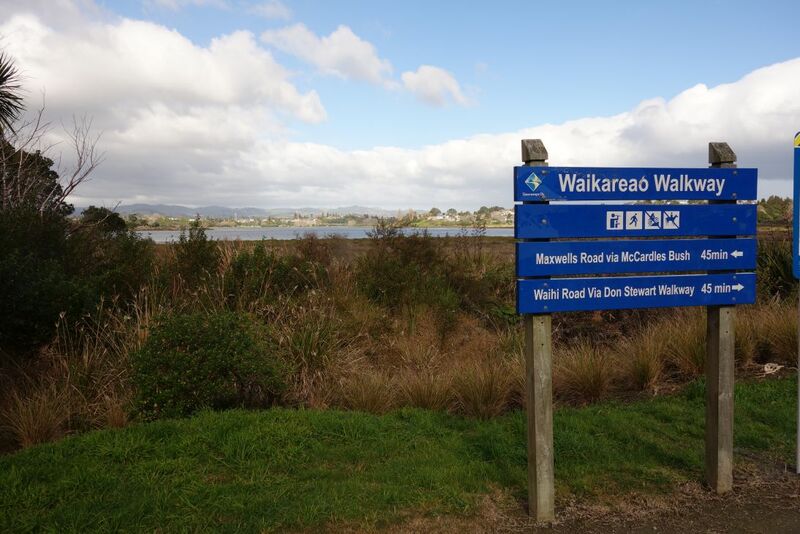 Waikareao Estuary Walkway consists of walking and cycling tracks and boardwalks around the estuary close to central Tauranga and Otumoetai. 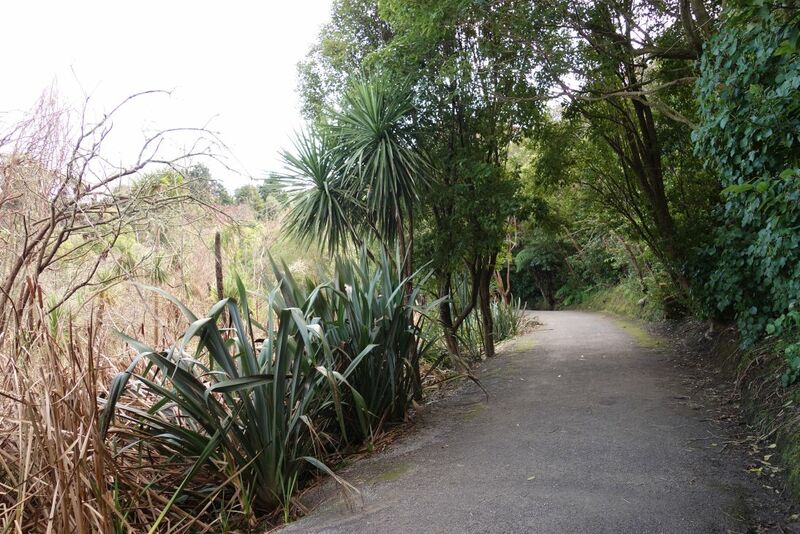 It is accessible from several locations, and several side tracks lead to and from the walkway. 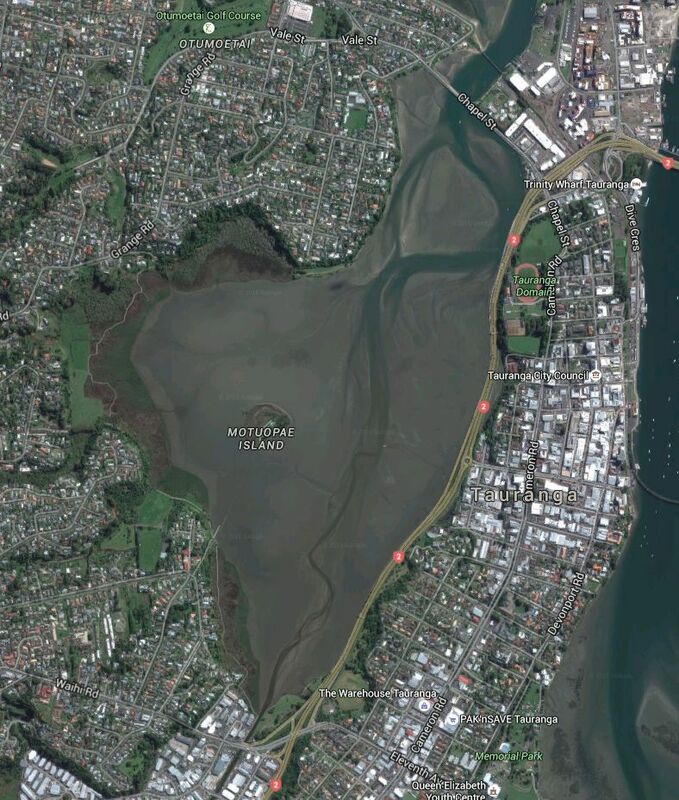 On the western side of the estuary the walkway passes over mangrove tidal zones, and through parks and reserves. 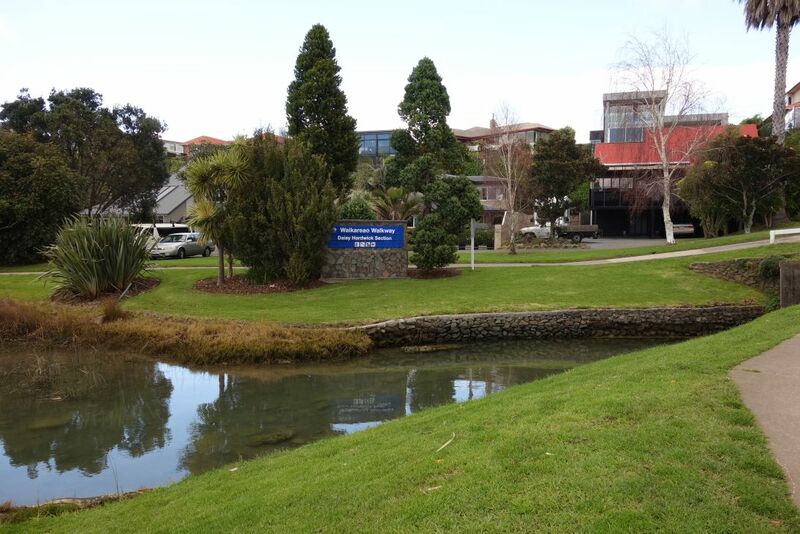 On the eastern side the walkway follows alongside Takitimu Drive, with the option of crossing over the busy road to more peaceful and green areas on the other side. 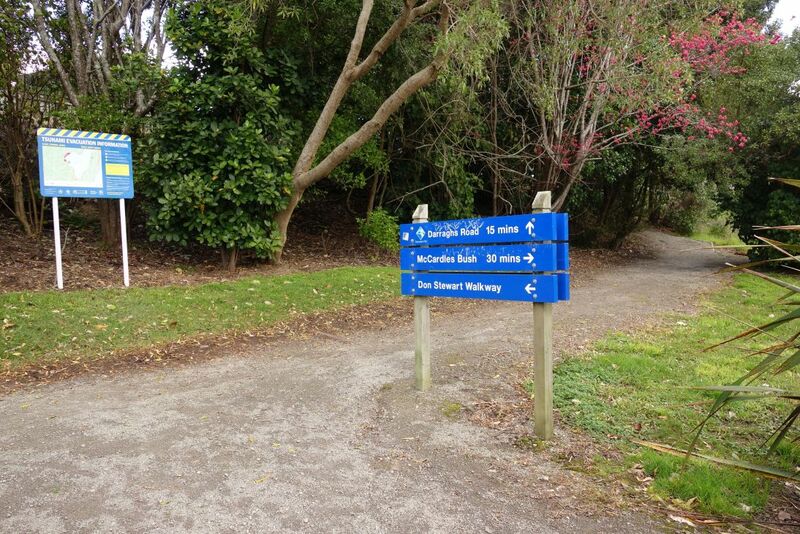 This walk was done in an anti-clockwise direction, starting and ending at the carpark on Maxwells Road, near Chapel Street, and following the track on the western side of Takitimu Drive between Waihi Road and Chapel Street. The Chapel Street part of the walk follows the footpath alongside the road. Total distance was almost 9 kms with a total time of almost 2 hours. 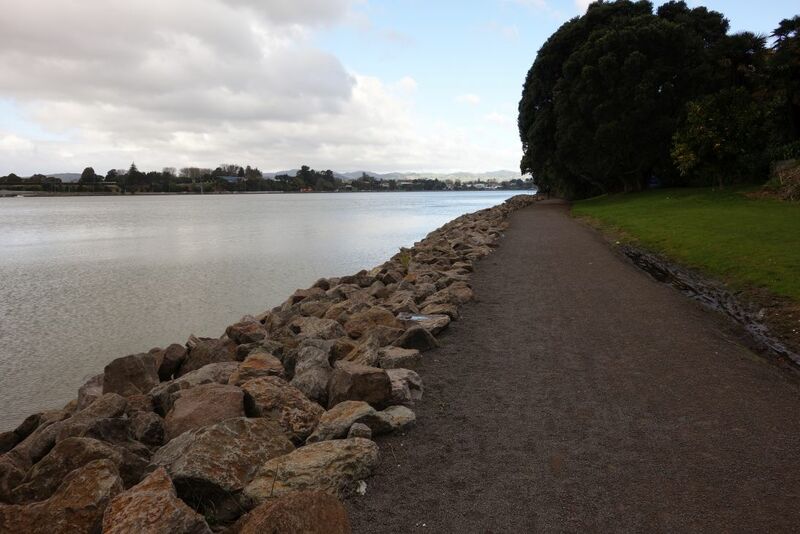 The walkway is described on the Tauranga City Council web site, and in their Walkways booklet. 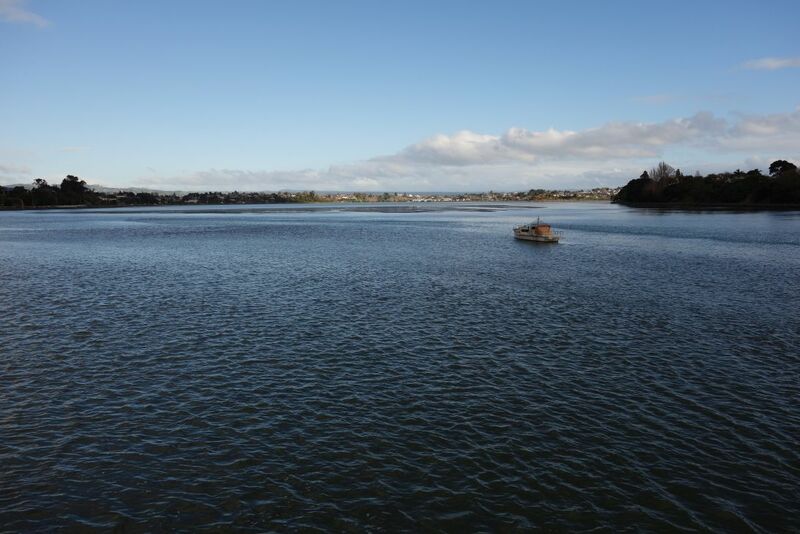 Waikareao has the meaning “sparkling waters of the new day”, with the waters being most sparkling at or near high tide. This walk was done shortly after high tide. 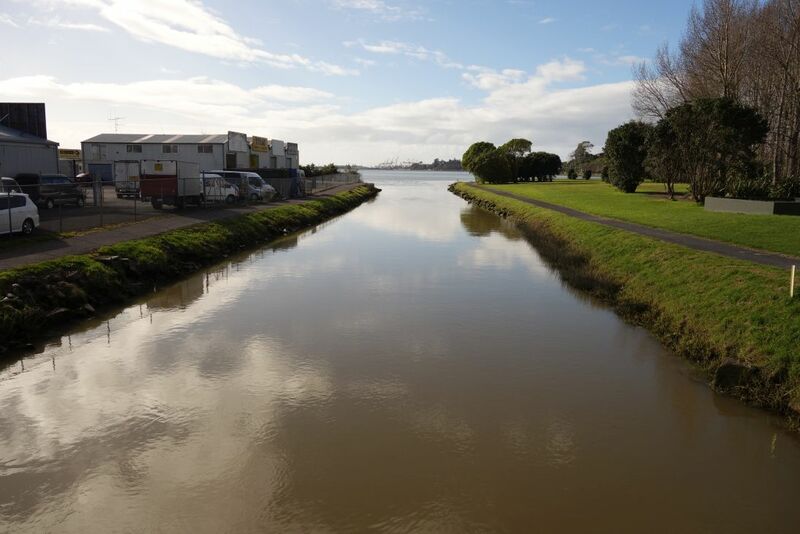 There are no toilet facilities at the Maxwells Road carpark, but toilets are easily accessible at two locations on the western side of the estuary, as the Coach Drive access point, and at Ngai Tamarawaho Crescent. 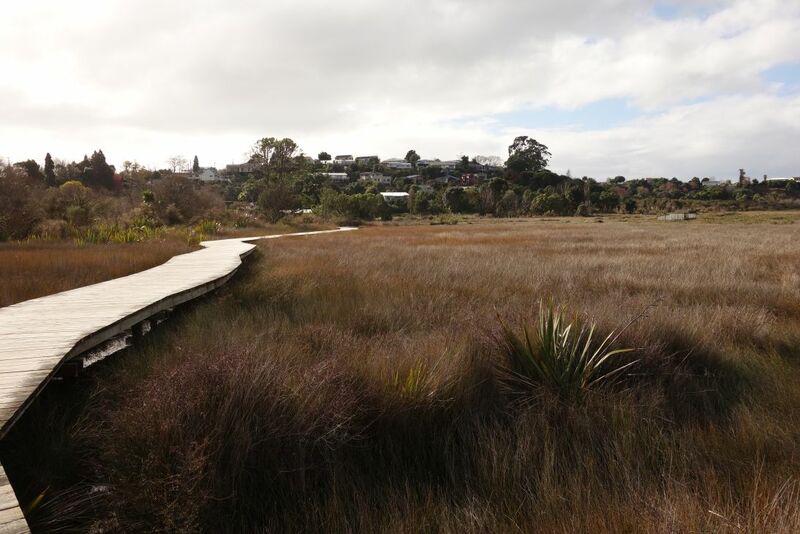 Since the walkway follows the shores of the estuary it is almost completely level, with no steps or steep sections anywhere. 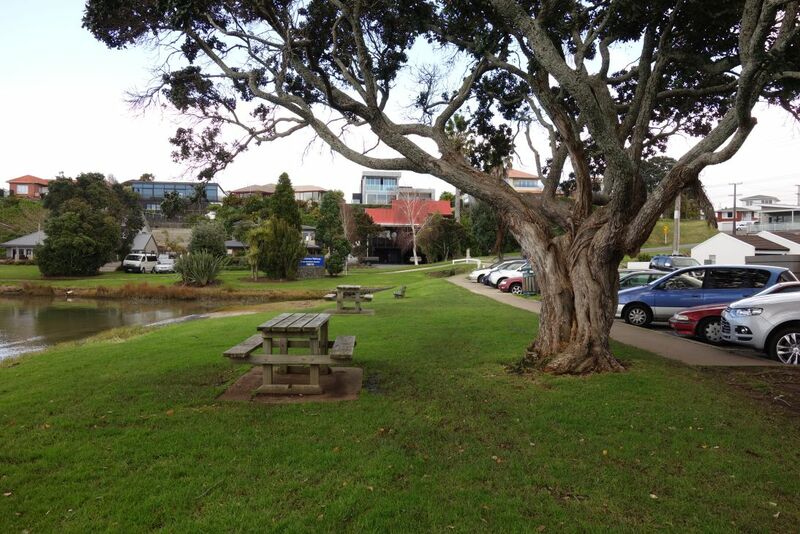 The parking area and picnic area on Maxwells Road. 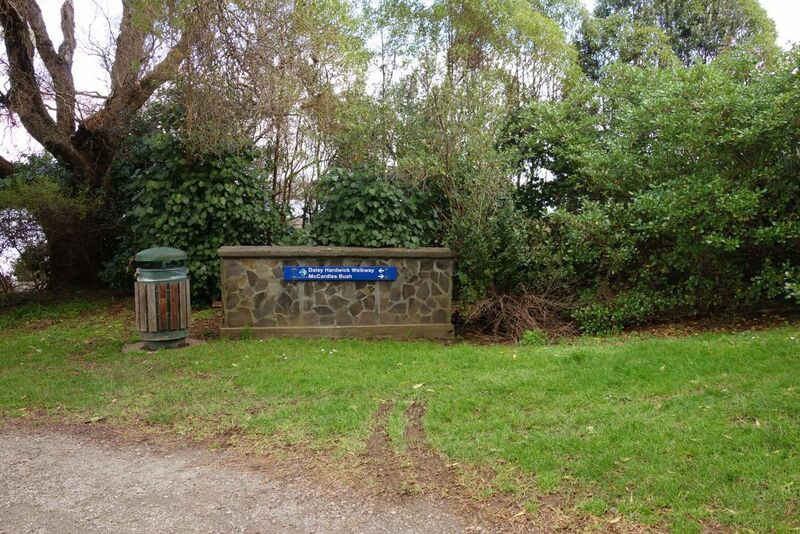 The Daisy Hardwick section of the walkway starts by the carpark on Maxwells Road. Looking back at the carpark on Maxwells Road from the Daisy Hardwick section of the walkway. Some of the sparkling waters can be seen here. A rock barrier has been installed along the Daisy Hardwick section to avoid erosion of the walkway. The walkway continues through an area known as McCardles Bush, where restoration work is being done to preserve the ecological area. 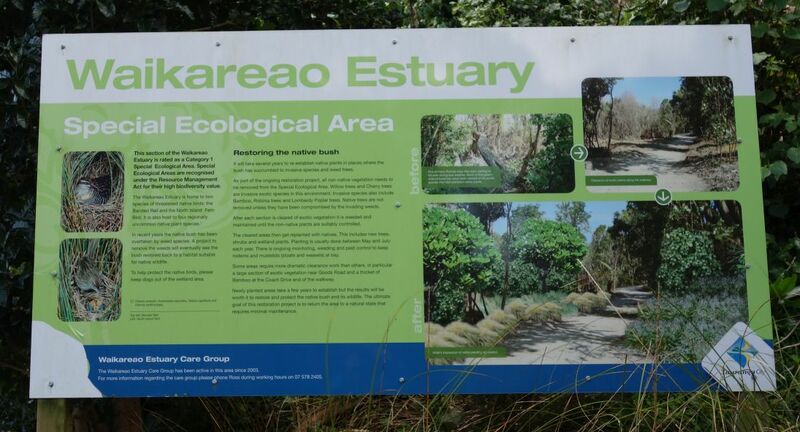 The area is rated as a Category 1 Ecological Area, recognised for its high biodiversity value. The walkway through McCardles Bush. A few parking areas and toilets are available at the Coach Drive access point. From Coach Drive the walkway continues towards Waihi Road as the Don Stewart Walkway. 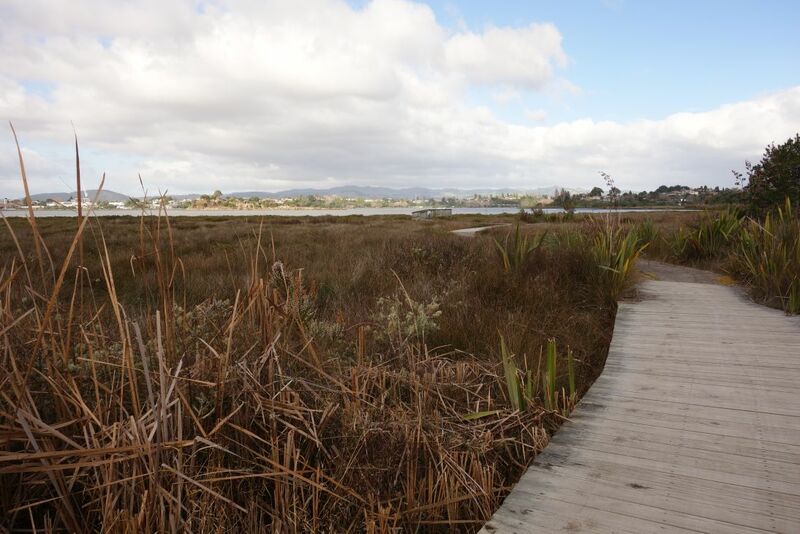 A large part of this section of the walkway is boardwalk across mangrove tidal zones. 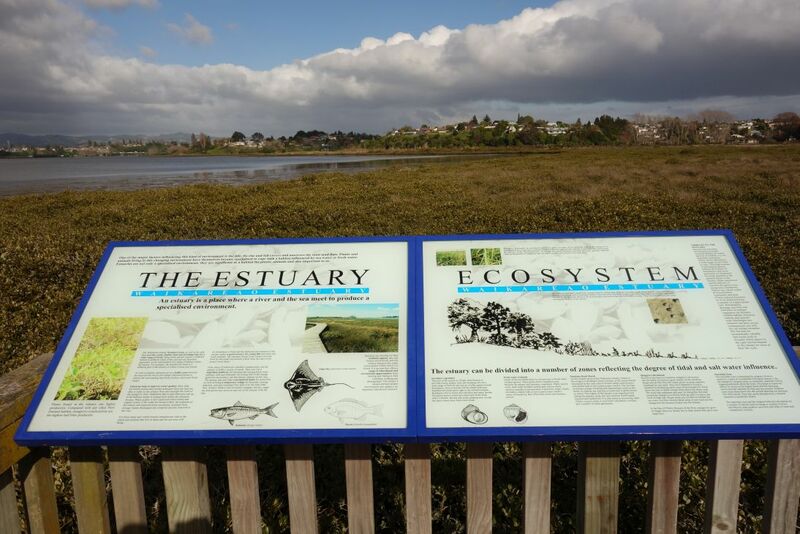 A lookout point just off the walkway provides views across the estuary and information about the estuary and the ecosystem. Information panels and views from the lookout. Looking back along the boardwalk, with the lookout on the far right. The walkway is popular both with cyclists and with runners and walkers, many of which have dogs accompanying them. 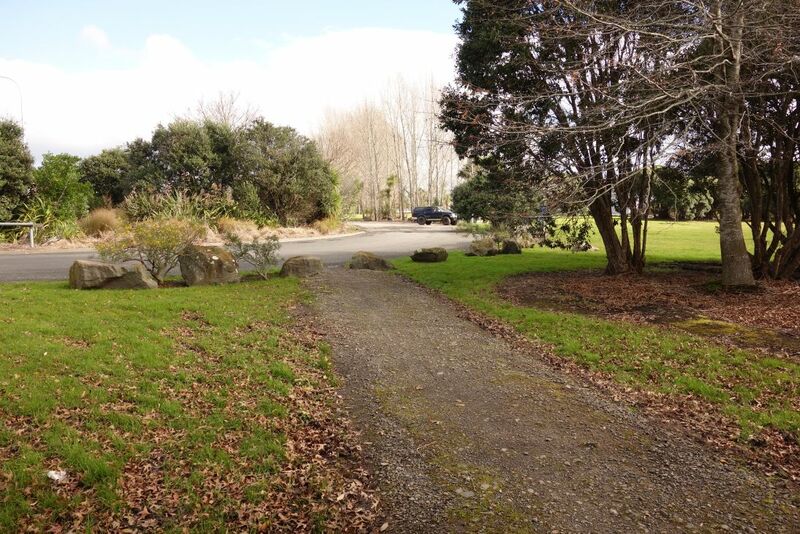 A short branch walkway on the right leads to Darraghs Road. 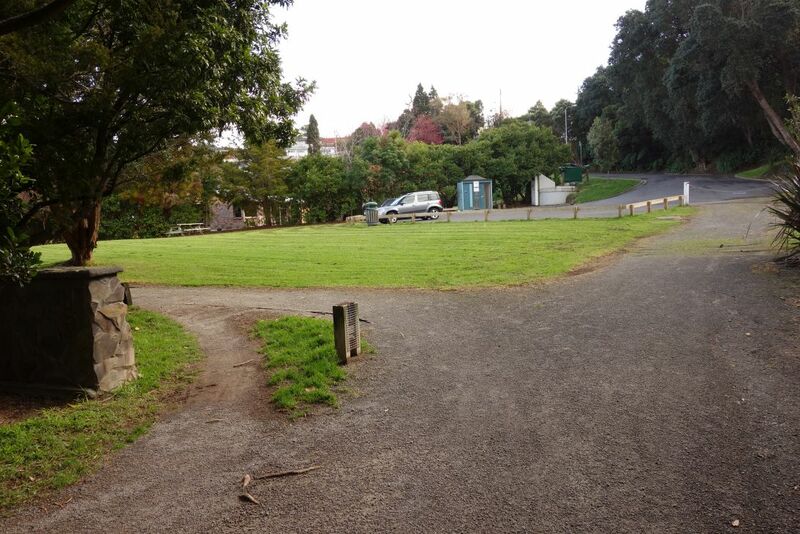 Don Stewart Walkway to Waihi Road continues on the left. 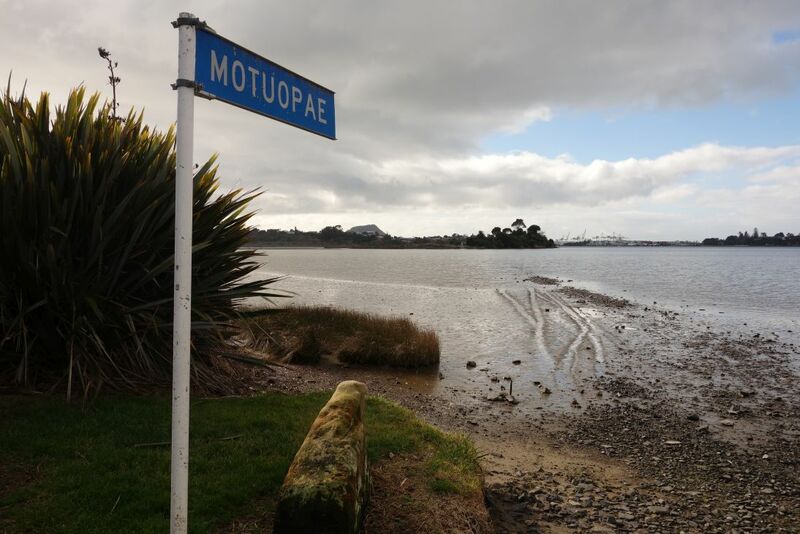 There are toilet facilities at the end of Ngai Tamarawaho Crescent, and apparently Motuopae Island (also known as Peach Island) in the estuary is also accessible from here at low tide. 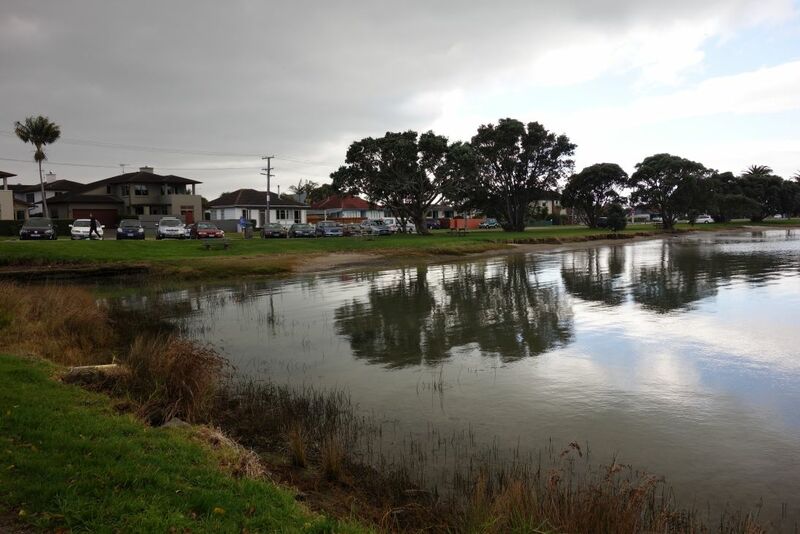 The island is now an urupa or burial place for Ngai Tamarawaho iwi. Approaching Waihi Road. 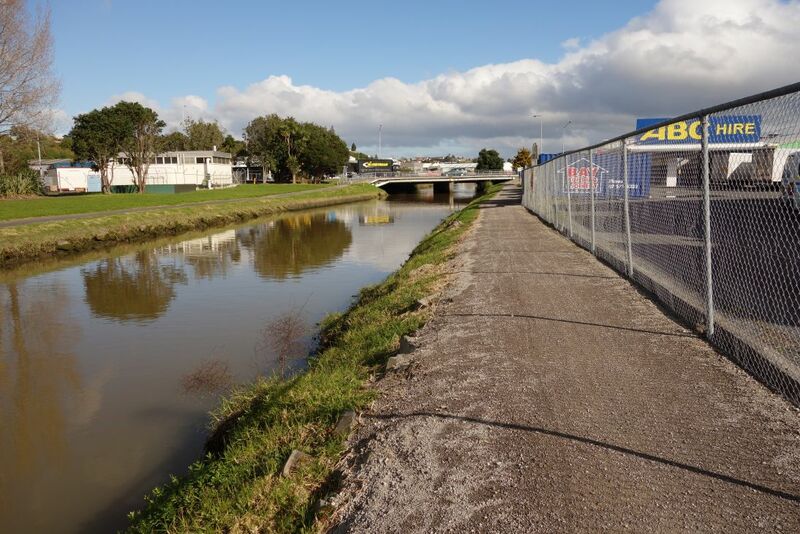 The walkway uses the footpath on Waihi Road to cross over the bridge. Looking from the bridge on Waihi Road. Various waterfowl can be seen at various places along the walkway. 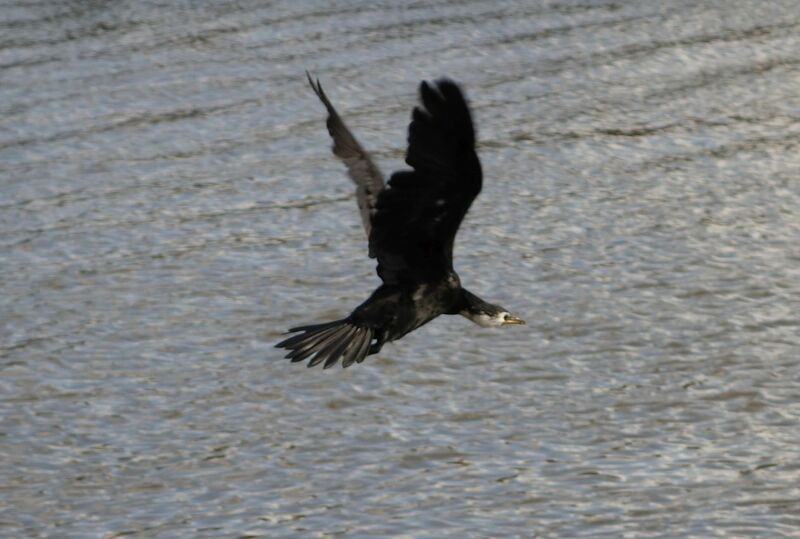 Here a shag. 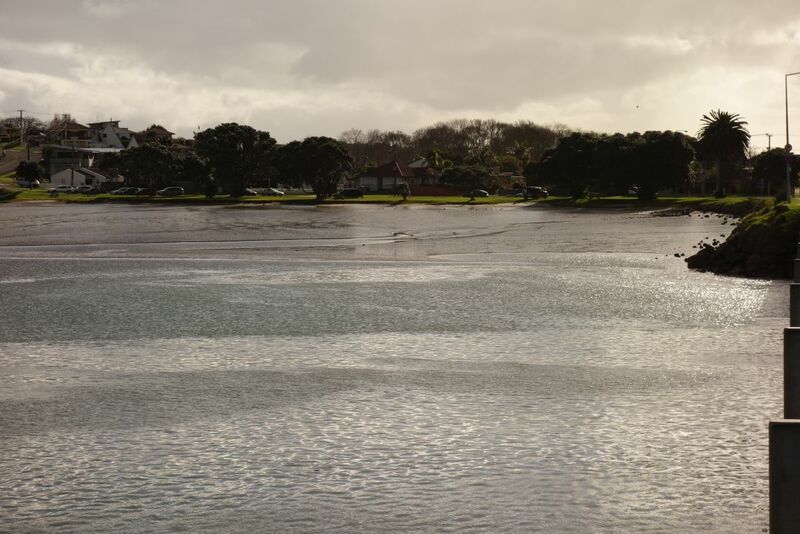 The parking area by the Waihi Road to Takitimu Drive on ramp. 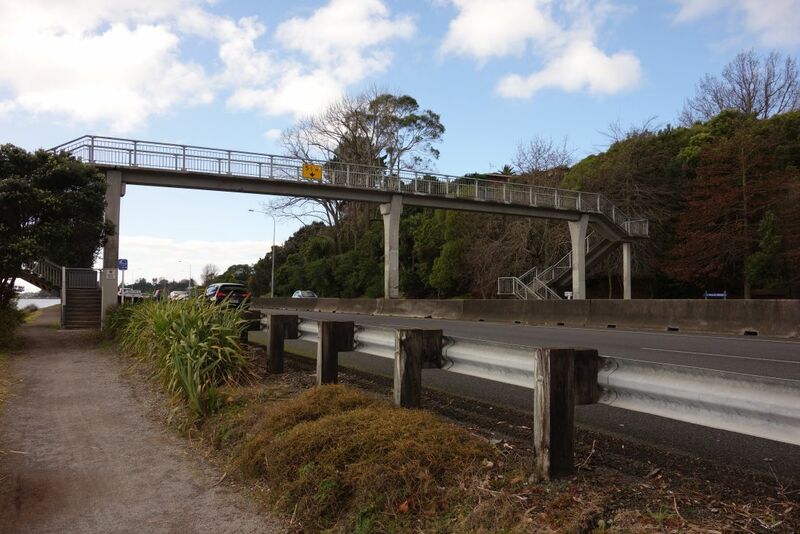 There are two pedestrian bridges crossing over Takitimu Drive. This one not far from Waihi Road. 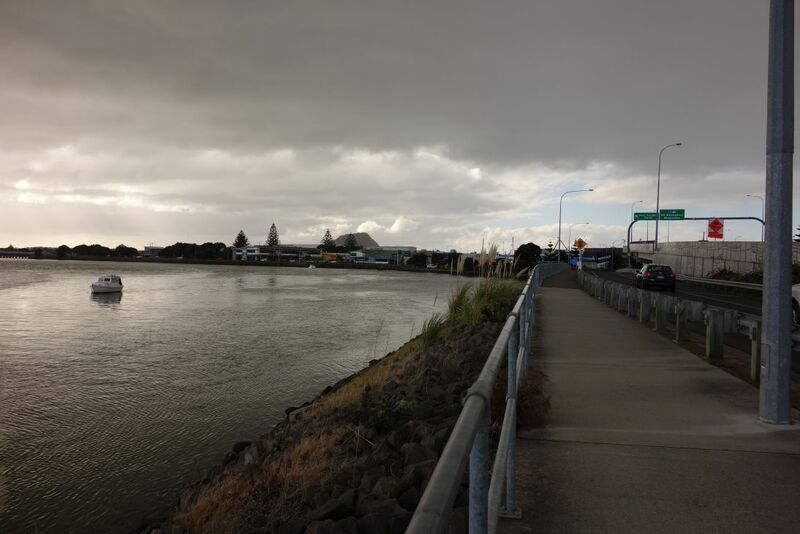 The second one crosses over to the Tauranga Domain as the walkway approaches Chapel Street. The walkway near Chapel Street. 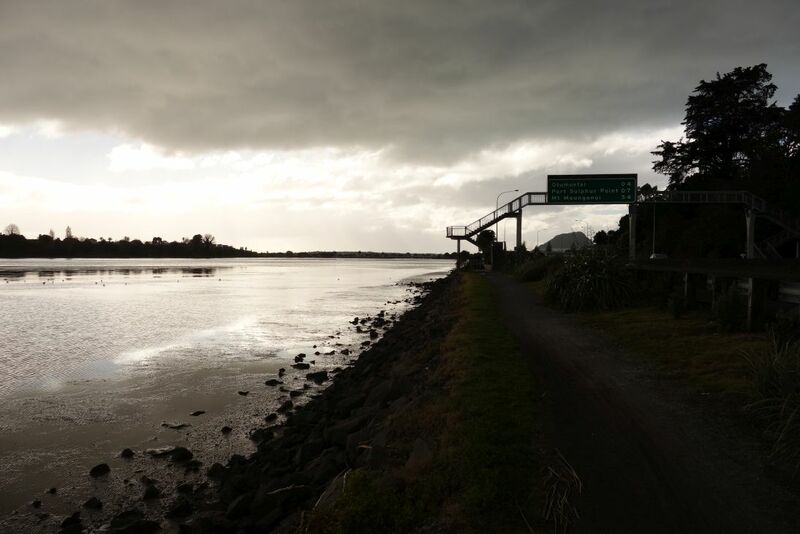 View of the Waikareao Estuary from Chapel Street bridge. 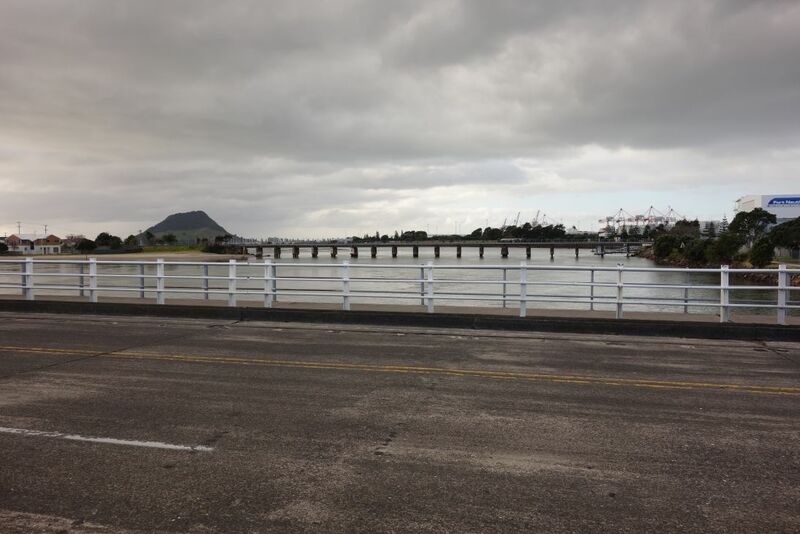 And the view in the other direction, across the railway bridge towards Sulphur Point and Mauao/Mount Maunganui. The parking area on Maxwells Road seen from the bridge on Chapel Street. The GPS tracklog shows the tracks walked, and some of the points of interest. 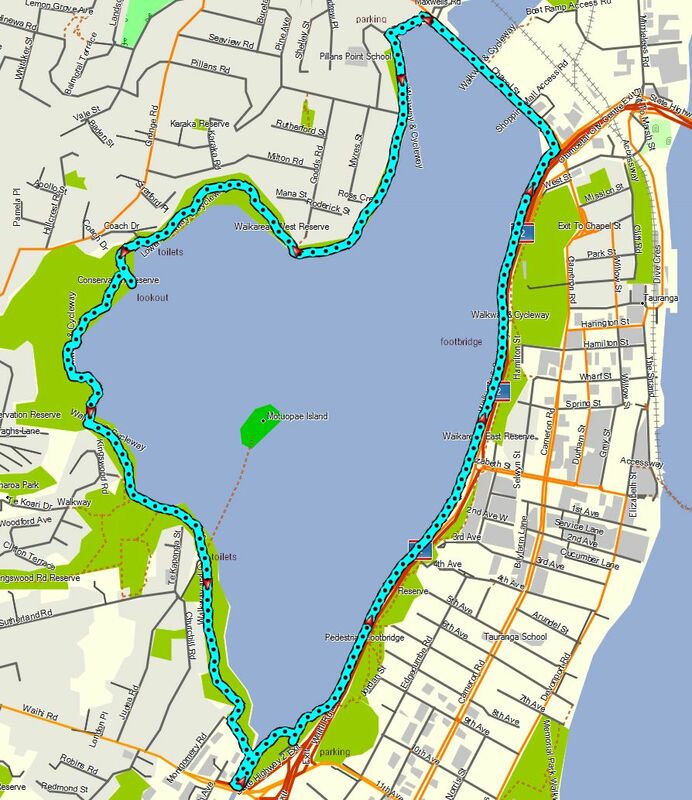 Total walking distance was 8.8 km, with a total time of 1 hour 50 minutes. The track was walked on July 25, 2016. 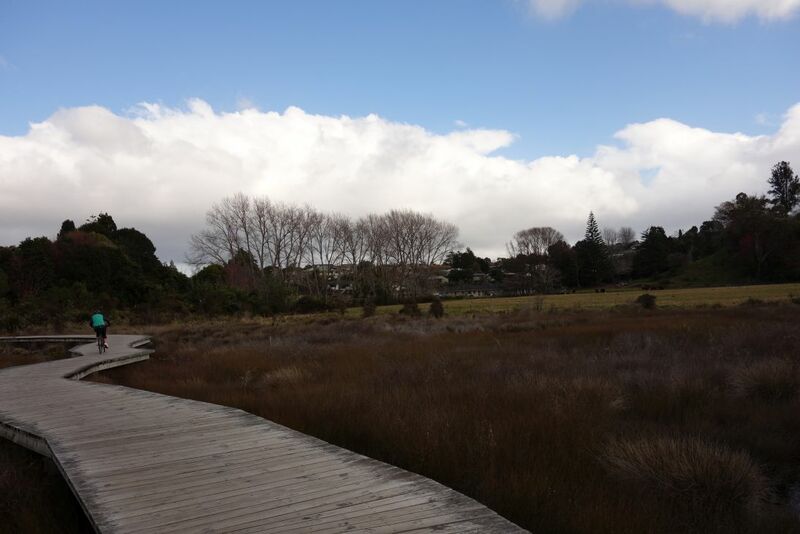 This entry was posted in Walks and tagged Daisy Hardwick Walkway, Don Stewart Walkway, McCardles Bush, Otumoetai, Tauranga, Waikareao Estuary on 2016-07-26 by nzartig.